The variety of figurines found in Jerusalem and Judah are aprt of a general phenomenon and should not be studied in isolation. While the individual items and types are—of course—interesting, it is important to understand that they form part of a repertoire of figurines: a miniature world that includes female figurines, horses with and without riders, as well as furniture. Studies on figurines have tended to focus on specific types, but this risks isolating them from other kinds of figurines. Considering the female figurines alone, for example, it is easy to imagine them related to fertility ritual or female goddess. In reality they form a smaller part of the wider figurine repertoire. The majority of figurines are animals, which can generally be interpreted as horses; some appear with riders, others without. The use and meaning of the figurines is not very clear. Explanations range from cultic or apotropaic use, especially for the female figurines, to toys, usually with reference to the animals. Their archaeological context, which is primarily domestic and occasionally funerary, suggests that they were part of daily life. Whatever their immediate use, the repertoire provides a small window onto social meanings and identities that were represented and manipulated through the medium of clay figurines. 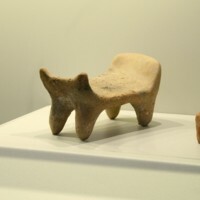 Fragments of figurines of four-legged animals are by far the most common figurine type in Judah and Jerusalem, and are part of a wider repertoire of clay figurines. 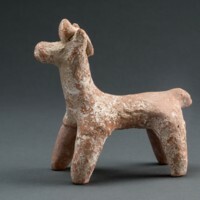 The horse and rider figurine type is common through the southern Levant during this period, and survives well into the Persian period (539–333 BCE). The particular style shown here, with very simple modelling and a pinched head, is typical of Judah.Few figurines survive intact or nearly so; the ones that do survive generally come from tombs. The horse here comes from Cave I in Jerusalem and the horse with a rider—the head broken off in antiquity—is from Tomb 106 in Lachish. The two complete figurines are unprovenanced, but are probably from Judah. The exact meaning and use of these figurines remains unknown. 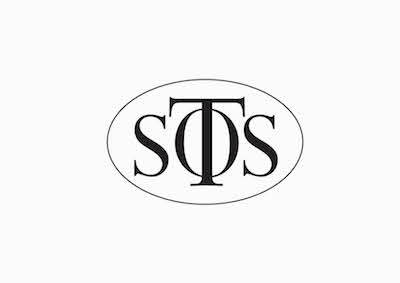 They do however, open a window on the way social meaning was contructed and manipulated in ancient Judean society. Horses were used only by the royal family and the military. Horses and riders, therefore, are likely to represent military power, and their frequent presence in the figural repertoire suggest that military power was a significant concern for the inhabitants of Judah. 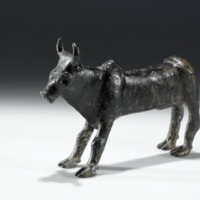 This bronze bull is a special find from a fairly remote open air cult site on the summit of a ridge in the northern part of the Samaria hills. The site is at least 6.5km away from the closest major city, though there were a number of small Iron Age settlements in the surrounding area. The site was only used for a short period of time in the twelfth century BCE before being abandoned, leaving little evidence of activity. The bull is bronze and would have had eyes made of a different material, pressed into the depressions in the face. The head is somewhat triangular and the legs have been made by looping the metal up over the back, creating a ridge. The tail is coiled on the right thigh, which is unusual; bulls were often depicted with the tail hanging between the back legs. The size of the object—quite large for a bronze figurine from Israel—suggests that it was itself a cult object, rather than a votive item brought as an offering. Bulls held an important position in ancient Levantine cult. They were associated with storm-gods, especially Hadad and Baal, but they could also symbolise other deities, including Yhwh. They represented the god's power and strength. Bulls are also sometimes used as pedestals for deities who stand on their backs; a bull figurine could thus represent the deity itself, or symbolise the presence of the deity. The golden calves in the biblical tradition provide a textual parallel to figurines such as this one; the golden calves may have been thought to represent Yhwh directly, or to symbolise his presence by serving as a pedestal for his invisible manifestation. The Megiddo Kernos in this collection may also attest to the cultic importance of the bull in early Iron Age society. The three horns of this figurine identify it as the head of a deity. The lack of a beard suggests a goddess, while traces of paint indicate that the face was originally painted red and the hair and the handle were painted black. The facial features and hair were modelled around a hollow object and the features are slightly asymmetrical. The nose is prominent and the lips are incised in a small smile. The head comes from Horvat Qitmit, a site in the Judean Negev region. Horvat Qitmit seems to have been a purely cultic site; hundreds of fragments of figurines, cult stands, cultic vessels, and statues were found at the site, but no evidence of habitation was uncovered. A large number of burnt bones were uncovered in one of the building complexes. The site had two main complexes: a bamah (high place) complex and an altar complex. The bamah complex was the larger of the two and produced more cultic finds, including this head of a goddess. The style of the pottery and finds has led to the site’s interpretation as an Edomite shrine, located near a number of small Judean settlements that in part guarded a road running from Edom through the Beersheba valley into Judah. 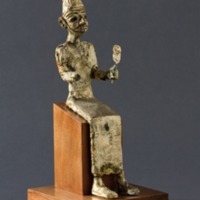 A number of the figurines, including this one, were not made in Edom but were made in the Edomite style from materials local to the region, as indicated by analysis of their chemical compositions. Whether the site was primarily used by Edomites, Judeans, or was open to anyone is not clear. The large number of figurines and cultic finds at Horvat Qitmit is in stark contrast to the small amount found at the Judean shrine at Arad, but the reasons for this contrast are not entirely clear. This item is a hollow pottery head and shoulders of a figurine playing a double flute, like one of the musicians from the cult stand from Ashdod. The figure has a large nose and protruding eyes, and the beard indicates it is male. The core was wheel-made with various other parts handmade and stuck onto the core. Originally it was painted in black and red. The figurine is one of a number of similar figurines found at Malhata. Only one other flute player appears in this assemblage (also male), but there are some female drummer figurines and a range of other anthropomorphic (human-shaped) and zoomorphic (animal-shaped) examples. As the body of the figurine is missing, it is unclear what the item was intended for. It may have been a small anthropomorphic figurine, part of a hollow cult stand, or perhaps part of a rattle with an anthropomorphic body. As the figure plays the flute it probably depicts a worshipper rather than a deity; musical instruments were often used in worship. 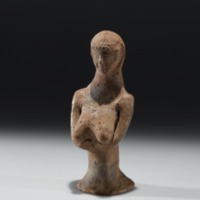 Comparisons with other figurines from sites such as Horvat Qitmit suggest that it reflects Edomite cultural traditions, from the area of modern Jordan, and close interaction between Edomites and Judeans in the Negev region in the seventh century BCE. 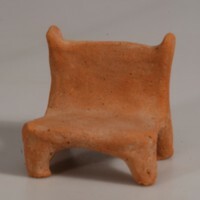 This clay miniature is from a tomb at Achziv. 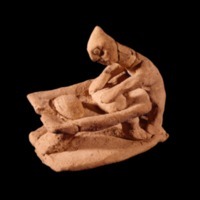 The subject of this tableaux is ambiguous, because of the rather rudimentary way it is modelled, but it is generally interpreted as representing a woman kneading the dough for baking. It is part of a wider tradition of figural representation in clay. 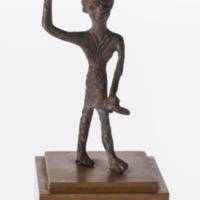 This bronze, anthropomorphic (human-shaped) figurine was one of several found at Megiddo. It comes from a context dated to the eleventh or tenth century BCE, probably domestic in usage. The figure holds a club or mace in its right hand, poised to strike, as is common with depictions of 'smiting' deities such as Resheph and Ba’al. The figurine wears a headdress and a knee-length robe, decorated with incised lines. 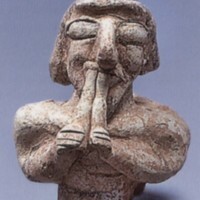 Resheph is a Canaanite god who was particularly prominent in Syria in the second millennium BCE. He was a warrior-god, associated with bringing violent plague and disease. He was previously thought to have connections with the underworld, but this has been recently called into question. Although Resheph was better known in the second millennium than in the first millennium, he appears eight times in the Bible. In Deuteronomy 33:24 and Habakkuk 3:5, he appears as part of Yhwh’s entourage, as Yhwh marches with his military might. In other references, however, 'resheph' no longer seems to refer to a deity: in Psalm 76:4 it seems to mean 'arrow', while in Psalm 78:48 it seem to mean 'fiery thunderbolt'. Notably, although the Bible seems to be aware of Resheph as a deity, there are no references to the people of Israel bringing offerings to him. The Resheph cult should thus be considered as an example of an cult practiced in the Late Bronze and early Iron Ages that began to be replaced by other cults in the later Iron Age. One cult supplanting Resheph was, as Deuteronomy 33:24 and Habakkuk 3:5 attest, the cult of Yhwh. 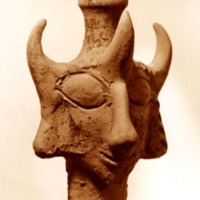 Ba'al—literally 'lord'—was a storm and fertility god widely known and worshipped in ancient Canaan, as recorded in biblical and non-biblical texts. He appears regularly in the Ugaritic texts from Ras Shamra and in numerous biblical texts, such as 1 Kings 18; Hosea 2:16–20; 2 Kings 11:17; 23:4–5; Zephaniah 1:4; and Jeremiah 2:8; 19:5, where he is a frequent object of the authors' ire, as they argue that the Israelites should worship Yhwh alone.This statuette of the god Ba'al is made of bronze and plated with gold. The deity is seated and holding an unidentified object in its left hand, while the right hand is missing. The facial features of the god are outlined with a black inlay and the left ear is pierced with an earring (missing from the right ear). The god is wearing a conical headdress and a long robe. 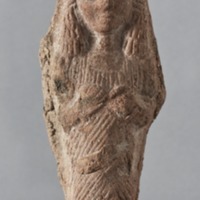 The statuette was found in debris during the excavation of a Temple at Megiddo. The excavators dated it to Late Bronze Age layers. Although the original throne of the god and small parts of the statuette are missing, on the whole it is remarkably well preserved.